* Adding turmeric powder, red chilly powder ,coriander powder are optional ingredients and u may replace it with 1/8 tsp of green chilly paste. Marinate the chicken with salt, ginger garlic paste, curd, red chilly powder, turmeric powder, ghee and coriander powder. Combine well and keep inside the freezer for 30 minutes. Chop the onion to big cubes and cook in the water for 2 to 3 minutes. Drain the water and grind with 2 green chilly ( mentioned in the ingredient list) to a fine paste. Transfer to a bowl and keep aside. water for 1/2 an hour. 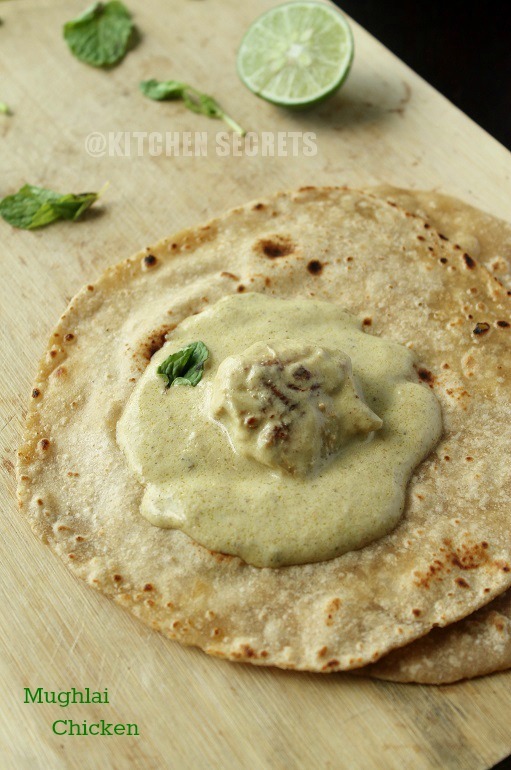 Peel the skin of the almonds and grind it with cashews and kas kas with very little water to a fine paste. 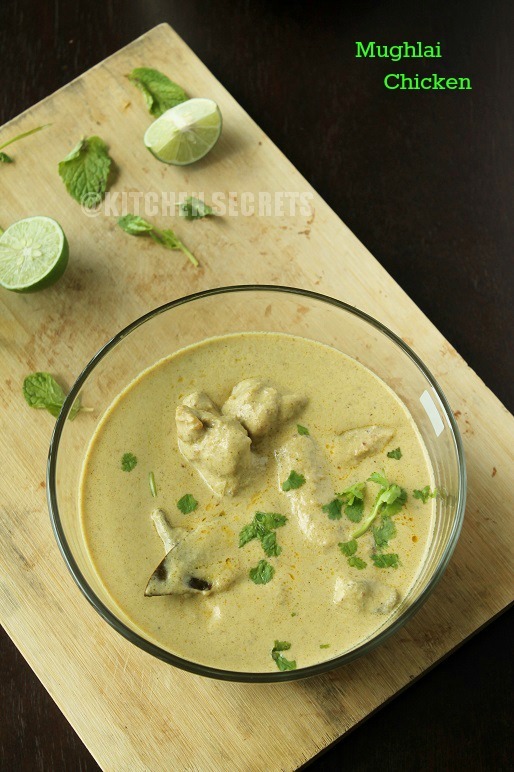 Heat a tawa with a tsp of ghee and fry the marinated chicken pieces to light brown in colour. It's ok, if it gets browned, it would be good if it resembles as it was grilled. And that's what this recipe demands. Switch off the heat and get on with the next step. Heat ghee in a pan, do the seasoning with cinnamon, cloves, cardamom , lace , shah jeera , bay leaf until it gets fried. To this, add the cooked onion green chilly paste, ginger garlic paste and fry for minutes on medium low flame. Now add the nuts paste to the masala and fry for a minute. Keep stirring otherwsie the mixture would stick to the bottom. At this stage add the garam masala powder, nutmeg powder, coriander powder, salt to the gravy mixture and fry for another one minute. Pour little water to the mixie jar to get the remaining of the nut paste and add this water to the gravy , add almost 1/2 cup of water. Cover and cook the gravy for 5 minutes. Now add the grilled chicken pieces and the heavy whipping cream to the masala. Combine well. 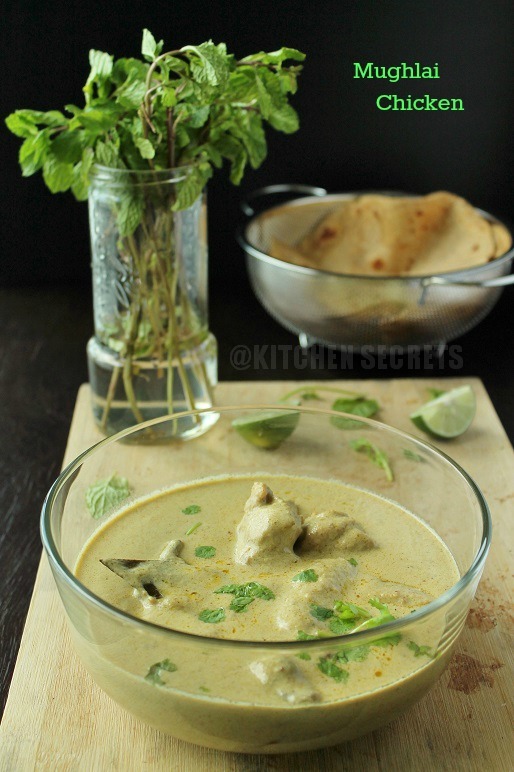 Cover and cook the chicken mughlai for 2 to 3 minutes until the consistency is semi thick, and coats the back of the spoon. Sprinkle the coriander leaves and switch off. 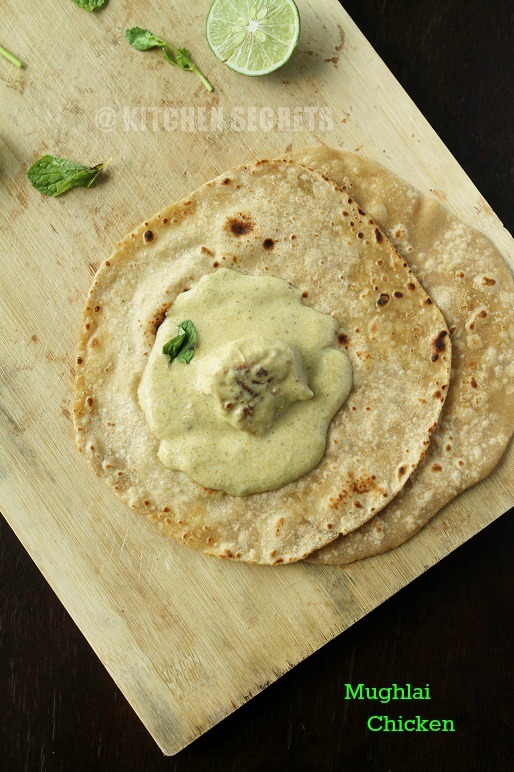 Serve hot with Phulkas, Roti/ Naan. This gravy is kinda bland as it has nuts and heavy cream, even though I've added 2 green chilly, it was quite bland for our taste buds. So , if you want this gravy to be little spicy to the bite, add 3 to 4 green chilly on the whole for the recipe. The gravy is totally off white in colour but mine is slightly pale yellow in shade as I've added turmeric powder while marinating the chicken. 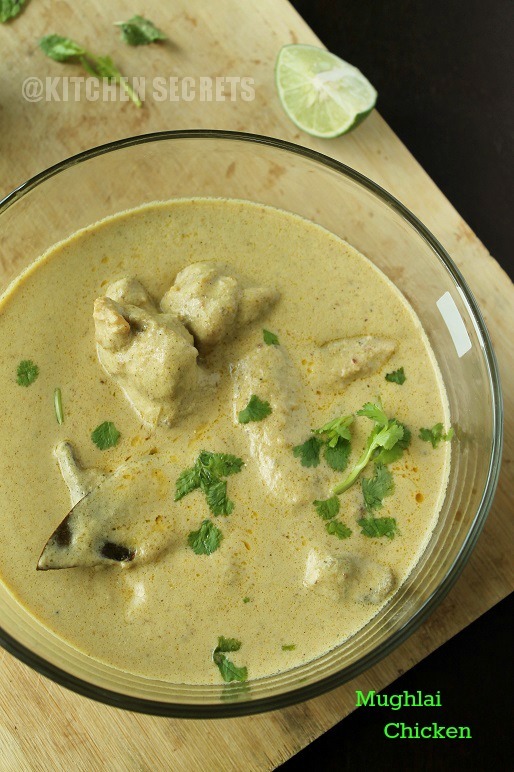 Royal treat, mughalai chicken looks seriously very creamy,delightful and irresistible. Aha looks so creamy and yummy Shobana :) Nice clicks too!! very rich and creamy curry.. liked your presentation..
drool so rich curry.bookmarking it. seriously now i wish to taste now,looks sooo creamy n yumm..
A stupendous meal Shanavi. Looks wonderfully delicious. Looks so rich & creamy, wonderful recipe!